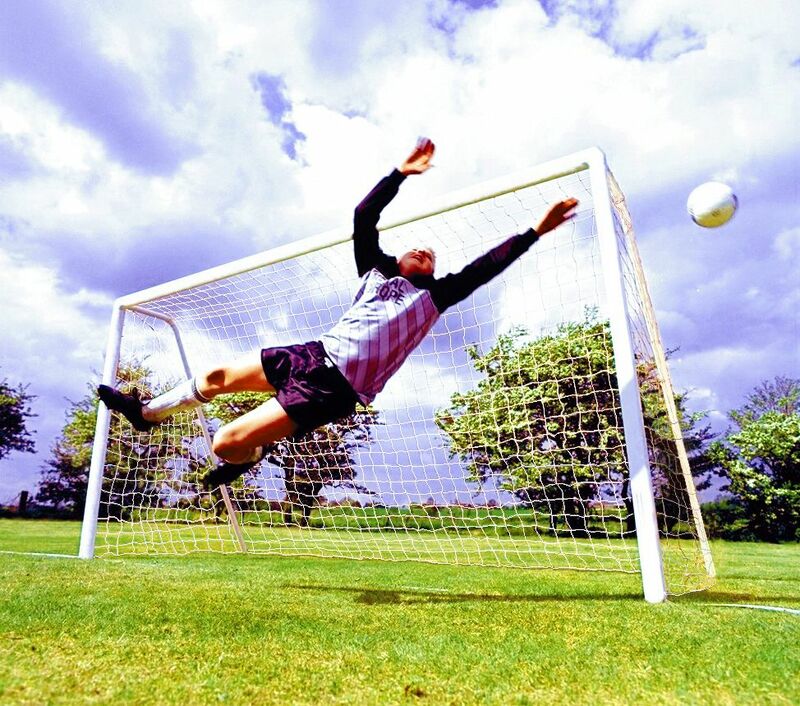 Think before buying goalposts – it is a product from day one that is going to need to be robustly built to take the constant shots and rebounds – so the garden goal needs to be well built, if it takes a little longer to assemble this is not so important, what is important is that it stays up after thousands of shots ! ideally, the goals should include a long Guarantee – only a company that is confident in its product will offer this. When buying garden goalposts, it doesn’t always pay to go for the cheapest goal post; quality garden goals can last 10 years plus if maintained. Buy from an established company that provides real football goal product reviews, not just customer service and delivery reviews, it’s the product you need to read about. Many companies incorporate paid review systems, this involves review companies chasing up reviews straight after the sale…so again the review tends to be regarding delivery and customer sales….the review must be about the goal product and how it works after some proper use, bear this in mind when reading paid for reviews. A goalpost can last many years so it’s worth investing in the best you can afford. Sturdy specially strengthened corner bracket design and strong overall construction, with proper locking Net support stanchions and a fully locking goal. Arrowhead net fixings and ground frame net fixings. Top Quality nylon nets that will not rot. Easy step by step assembly instructions supplied. Ground anchors and safety ground pegs included. This goal is highlighted as one of the best garden goals because it includes a one section crossbar, this makes the crossbar straighter than other sectional crossbar goals and an overall sturdier garden goal. Sturdy specially strengthened reinforced corner brackets and weatherproof. Fully locking goal with locking net supports, quality nylon rot proof net, weatherproof, easy to assemble with step by step assembly instructions provided. Ground anchors are included. 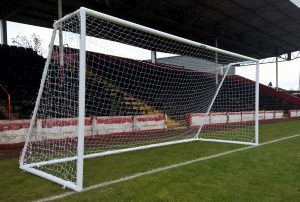 This goal has an optional tubular aluminum crossbar – This is highly recommended if the budget allows as this will prevent the unsightly dipping of crossbars as seen on other goal post makes; the current British Goalpost Safety Standard BS8462 does not allow any tolerance for a dipping crossbar so if the crossbar dips it will not conform. This goal is easy to store or bring out on matchdays…the sides can concertina in with nets left attached…so when you want to use the goals it is quick and easy to just fit the crossbar and the back bar and then clip the nets on. There really is No faster goalpost assembly other than the ITSA GOAL folding aluminium goals but they are fully welded and more expensive. 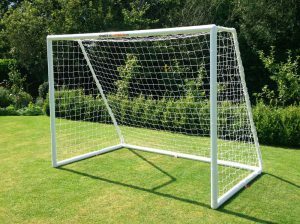 So this is a very competitive goal for such a large goalpost – Recommended for larger gardens or the equivalent ITSA GOAL 12×6 goalpost above. Strong strudy garden goal post design with locking Net supports, nylon rot proof net, weatherproof, easy to assemble, ground anchors included, proper roof to the net. Competitively priced. Strong sturdy goal post design with locking net supports. 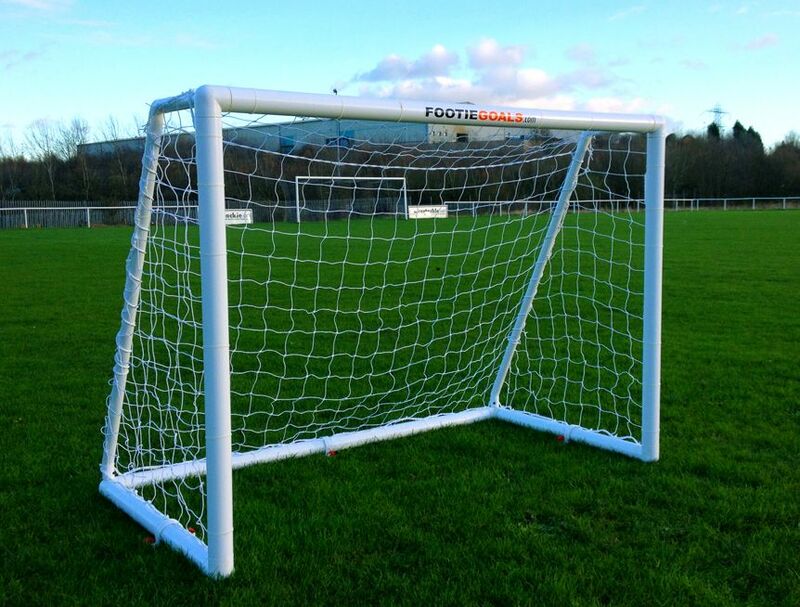 12 x 6 One of the most popular goalpost sizes being 6′ high. 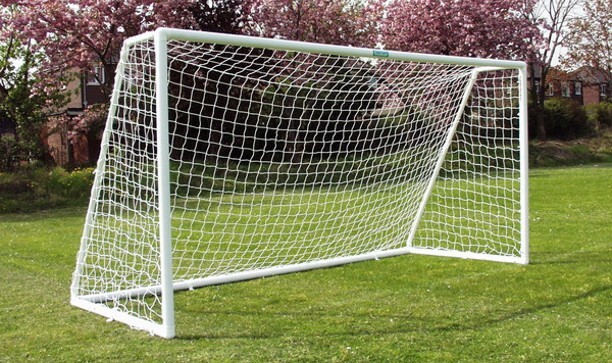 This goal is very competitive for the size of the goal, the goal is for use on grass only and includes unique ground anchors that do not disturb the turf. Top quality nylon rot proof net, weatherproof, easy to assemble, ground anchors included, proper roof to the net. We suggest avoiding flimsy metal goals. Avoid heavy steel goals, potentially dangerous – not worth the risk with children! Making sure your goalposts have locking net supports – it’s not ideal if every time your shot hits the back of the net, the net support comes apart! So look out for goalposts that have net supports that just push in holes, makes sure they lock into the corner with a locking button. Check product reviews, make sure the reviews are about the product not the fast delivery…it’s the product you need to know about. Buy from an established company that provides real football goal product reviews, not just customer service and delivery reviews. Avoid bending net supports – they bend and eventually crease. 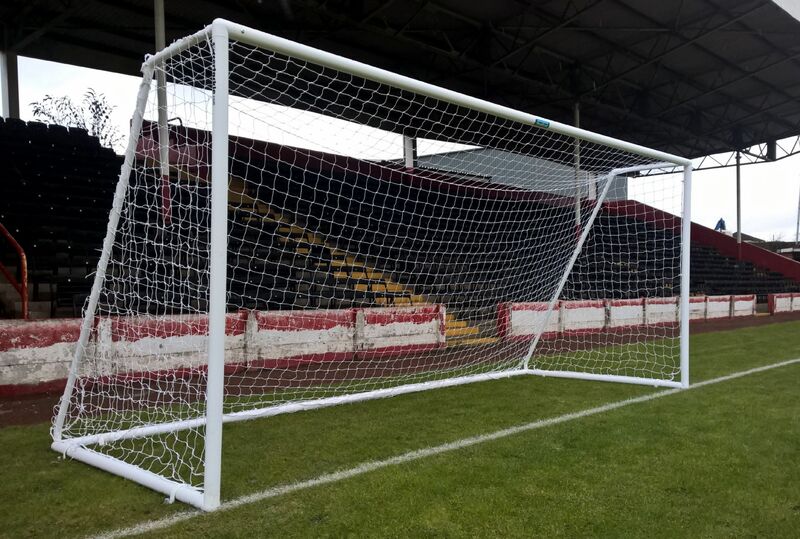 Avoid dipping crossbar goals on 12×6 and 16×7 goals – instead of relying on potentially retouched goalpost photographs at the time of buying a goalpost online … take a look and see the goals in videos online, a quick search will reveal what the crossbars really look like. 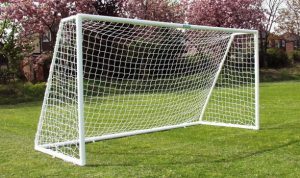 A goalpost looks much better when the crossbar is straight and ITSA GOAL offer the best one section crossbar versions. The current British Goalpost Safety Standard BS8462 does not allow any tolerance for a dipping crossbar so if the crossbar dips it will not conform. Any report about goalposts that does not include the two leading brands ‘ITSA Goal’ & ‘Footie garden goals’ should be taken with a pinch of salt. 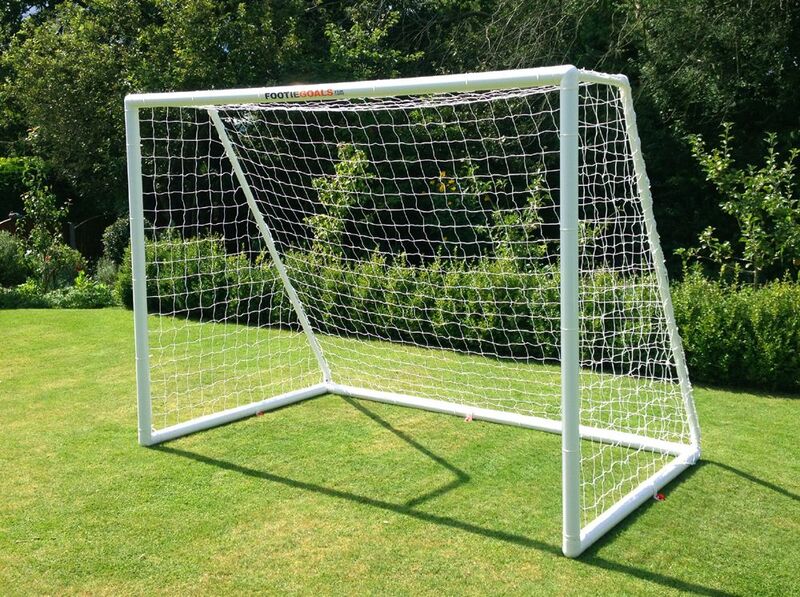 Those judging garden goalposts claiming to be impartial should include the leading and top garden goal post brands. If any ‘TOP TEN GOALPOSTS FOR THE GARDEN’ review website does not include ITSA GOAL products it cannot be relied upon to be anything other than a sales tool that is misinforming buyers.ITSA GOAL was the inventor of the first plastic football goals and the only children’s football goals to be approved by the Football Association and FIFA back in 1992. 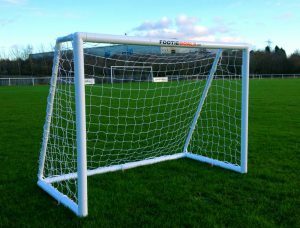 ITSA GOAL has been making plastic goals for over thirty years, longer than any other manufacturer. The company is highly regarded throughout the footballing community and their products have never in all that time had a bad review. They’re recognized for offering better longer lasting quality nets, longer warranty and the best value for money so why are they not included? Maybe these reports are not impartial as they state they are but a new fake news platform to sell poor quality products to unsuspecting buyers of garden football goals.